Imagine you’re enjoying a stellar post-meal conversation with your spouse when you suddenly clutch your chest in agony. You silently curse yourself for gobbling down a huge ribeye steak and an overabundant side of truffle fries for dinner. That pain is acid reflux, and it can happen at the most embarrassing moments. Acid reflux happens when some of the contents of your stomach leak out and flow back into your food pipe when the entrance to your stomach doesn’t close properly. This causes a burning pain in the lower chest area, most times after eating. More than 60 million Americans experience acid reflux at least once a month. If you’re experiencing acid reflux, you will notice frequent burping, nausea after eating, bloating and upper abdominal pain. Acid reflux occurs the most after eating a heavy meal, while bending over or while lying down on your back. The symptoms are more likely to flare up after eating fatty foods, large meals, alcohol, spicy foods, chocolate citrus fruits… and even peppermint! The people who are most at risk of developing acid reflux are those who are obese, smoke, maintain low levels of physical exercise and take certain medications. Although many foods can induce acid reflux, there are some ingredients you can use to help ward off your irritating symptoms. Read on to discover which ingredients relieve acid reflux symptoms. The rumors are true! Milk actually does relieve acid reflux symptoms. Because milk is a thick substance, it helps to coat the stomach and temporarily keep stomach acid at bay. When reaching for a tall glass of milk to alleviate your acid reflux, be sure to grab fat-free, low-fat and reduced-fat milk, low-fat buttermilk or almond milk. Other milk containing full-fat percentages could potentially irritate your stomach considering the higher fat content may stimulate the stomach to produce more acid. It’s exciting to see the many discoveries being made every day about how to use CBD oil. CBD oil is made from high-CBD, low-THC cannabis. 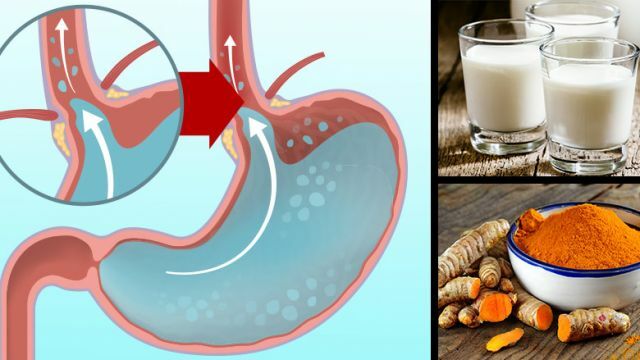 It has proven to be beneficial to common ailments, such as insomnia, lack of appetite, headaches and anxiety, so it comes as no surprise that it can also be used to treat gastroesophageal reflux. CBD oil has anti-inflammatory properties and is known to interact beneficially with digestive systems, which can reduce pain and calm gastrointestinal spasms. Turmeric has been traditionally used for conditions associated with the digestive system but it’s a special ingredient that flies under the radar most times. Turmeric is the spice that gives curry its yellow color. It’s an herb that has been used in India for thousands of years for seasoning and medicinal purposes. Turmeric has potential therapeutic benefits, including anti-inflammatory, antioxidant, antimicrobial, antiplatelet and anticancer effects, as well as choleretic and carminative actions. If you’re a coffee lover but suffer from acid reflux, there’s still hope for you to enjoy a piping hot cup of Joe without suffering tremendously. Decaffeinated coffee serves as a hot beverage to settle stomach gasses and can soothe acid reflux symptoms. Decaffeinated coffee has shown to significantly diminish gastro-oesophageal reflux, according to a study by Aliment Pharmacol Therapy. Although regular coffee can irritate your stomach, there are a few ways to indulge in your coffee lover ways. First things first, find a coffee bean with low acidity. As a rule of thumb, the darker the roast, the better. If you can, try and get ahold of Mexico and Sumatra coffees as they are known to be lower in acidity. When decaf coffee is processed using the mountain water method, it reduces the amount of acidity due to the water process caffeine extraction. Sometimes acid reflux symptoms can be solved by a change in diet. The Mediterranean diet is primarily centered around vegetables, fruits, nuts, beans, cereal grains, olive oil and fish. Proton-pump inhibitor (PPI), which reduces the amount of acid produced by the stomach, is typically prescribed to acid reflux patients. However, when compared for effectiveness during a study, the Mediterranean diet proved to be just as effective as a medical treatment. During the study, the individuals who ate a Mediterranean-style diet combined with alkaline water had reduced symptoms. Saute leeks and garlic in oil until tender; set aside. Coat a 13×9 baking dish with cooking spray. Arrange basil in a single layer in dish, then top with fish fillets. Sprinkle with salt. Top with leek mixture. Arrange tomatoes and olives over fish. Thinly slice half of the lemon; place over the top. Squeeze juice from remaining lemon over all. Cover and bake at 425° Fahrenheit for 15 to 20 minutes or until fish flakes easily with a fork. Garnish with rosemary. Enjoy! Acid reflux doesn’t have to ruin your life or prevent you from indulging in your favorite foods and drinks. Keep in mind the way you sleep can also affect the severity of your symptoms. When lying flat on your back at night, the position can allow acidic stomach contents to flow freely into your esophagus. To reduce your nighttime acid reflux issues, try to stay off your back at night as much as possible. If you sleep on your side, avoid sleeping on your right side, because stomach acid can seep into the fragile lining of your esophagus. The best way to sleep is on your left side. Studies have shown that symptoms are less severe while sleeping on the left side of the body versus the right side. What ingredients do you typically use to subdue acid reflux? Leave your comments below! Next articleTeenager Dies After 10-Pound Tumor Removed — Should Doctors Have Helped Him Sooner? Hey Buddy!, I found this information for you: "These 6 Daily Hacks Could Cure Acid Reflux For Good". Here is the website link: https://www.thealternativedaily.com/6-daily-hacks-can-help-ditch-acid-reflux-good/. Thank you.